January 20, 2012 – I had a once-in-a-lifetime opportunity today: to tour the Royal Library and Bindery at Windsor Castle, areas which are usually closed to the public. Tours for historians, librarians, and others are sometimes given, but today’s tour was the first such opening of the Royal Library to the public ever, a trial run for possible future tours. It was a very rare occasion indeed and the staff running the event were keen to congratulate us on being part of the day. We were welcomed at Winchester Tower with an orientation and a short history of the library. About 16 people were on hand to take the tour. There were almost as many staff making sure we didn’t stray off and start pulling books off the shelves! Due to space limitations, this number was split in two, so for the actual tour we were in groups of eight. 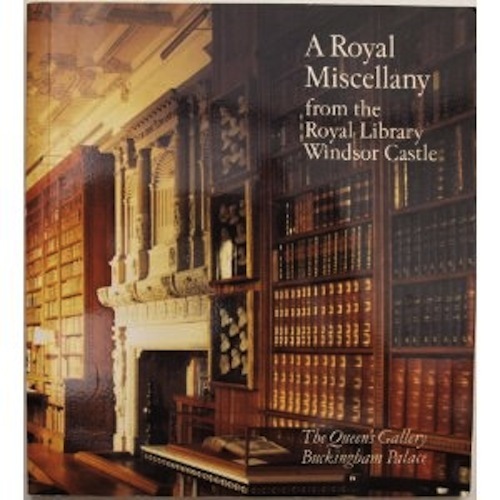 A view of the Royal Library, Windsor Castle, on the cover of A Royal Miscellany. The Royal Library today dates from the 1830s although it contains items that are much older. King George II had no interest in reading and in 1757 donated the library then in existence to the newly founded British Museum. His son King George III amassed a new library of 65,000 volumes. At his death, it was unclear whether this library was the personal property of the heir or if it belonged to the state. His son George IV, who also did not have an interest in reading, gave the library to the state and it now forms an important part of the British Library. George IV’s brother, King William IV, was outraged that the library was given up and was adamant that there should be a new collection. It was he who began the library as it now stands, ensuring also that future monarchs could not dispose of it as they saw fit. The Royal Library is comprised of three rooms and forms part of the current Queen’s private apartments. They are a long gallery that was built for Queen Elizabeth I, the bedroom of Queen Catherine of Braganza (wife of Charles II), and the bedroom of Queen Elizabeth of York (wife of King Henry VII.) We were told that these rooms are often used by the Queen today to entertain guests after dinners at the castle. Photography was not allowed and I was unable to find many photos on the internet. However, I have attached the cover of an out-of-print overview of the collection that shows a fireplace built for Queen Elizabeth I, still in working order, a good view of the book-lined walls, and one of several ivory-inlaid tables made for King William IV. Upon entering, you very much feel as though you are stepping into a different (think: Hogwarts) dimension. The walls are lined with treasures, including many mementos given to members of the royal family over generations. It is a place steeped in history. The dimensions are grand, yet still on a human scale. It is a place, I imagine, where people whose lives are usually spent in the public eye, can look out of the massive windows onto vistas stretching for miles down into the Thames Valley, the Long Walk, and the Great Park, and just pause to appreciate the beauty of the countryside. Among the items in display cases were a book of psalms with a poem written in the hand of Elizabeth I; A Counterblaste to Tobacco – an anti-tobacco work by King James I; autographed presentation copies by many great writers, including Tennyson, Sir Walter Scott, and Ted Hughes; and what is perhaps one of their greatest treasures, the Mainz Psalter which is the second, and rarer, book ever printed, coming after the Gutenberg Bible. Moving on from the library, we were next treated to a tour and demonstration in the Royal Bindery. Using tools from the reigns of George III and WIlliam IV, the artisans working in the bindery have the responsibility of caring for the literary treasures of the Queen. Using traditional techniques and technology little changed since the medieval era, these very dedicated people take what are often brittle, decaying materials and bring them back to life. One example of this is what will count as an unforgettable part of the tour. The bindery has for the past year been working on the rebinding of an original, first edition print of John James Audubon’s The Birds of America published from 1827-1838 in England (American printers at the time could not handle the job.) This copy was initially acquired by King William IV. Originally sold by subscription, the plates would have arrived in small numbers over a period of years. They were then bound by the Royal Bindery in the early 1800s. The original binding, nearly 200 years old, was in terrible condition. Turning the pages of the volumes had begun (decades ago) to damage the prints themselves. By adding a ‘guard strip’ to the inside edge of each plate, the conservators were able to begin rebinding the four volumes. Volume II is nearly complete and the rest will follow this year. The volumes will be finished using tools from the reign of George III to duplicate the original spine’s gilding and ornamentation. It is the first time that a set of Birds of America has been rebound when it’s size actually increased! In re-bindings of other sets, prints were trimmed or part of the plates would be used in stitching. The plates, which Audubon personally oversaw in production to ensure the correct coloration, are immense. They are classified as ‘double elephant’ in paper sizes, which is 40 x 27 inches, the largest paper size available. Turning the pages required two people to prevent damage. Carrying the volumes requires three. To see dozens of these plates together as a whole collection (many copies of this work were broken up and the plates sold separately), was a genuine privilege. Even more so as we discovered that also today, another complete Birds of America set, once owned by the Duke of Portland, sold at Christie’s Auction House for just under $8,000,000. A treasure indeed. The three-hour tour was given twice and it is to be evaluated for the future. Having been to many great museums, worked in wonderful libraries, and been inside palaces on tours before, I can say unequivocally that this went far beyond any previous such experience I have had. We were walking in the footsteps of history and stepping into a space that is largely private and personal. If we were hurried along, it was due less to limited time than, I think, to the preciousness of the place. The air of history can be disturbed by too much traffic. I deeply appreciated getting this little peek and am very happy to be able to share my reflections with others. At the center of Windsor Castle, it is clear, there is creativity, commitment, and continuity. That is what I took away from my tour, and guarding those core tenets should guide the Castle staff in determining the use and openness of this very special place in the future. « Third Time’s a . . . Fantastic posting, James! It’s *almost* as good as having been there in person. Wonder if U-M has ever had its complete set of the Aubobon books re-bound? Thanks Michelle. Glad you enjoyed it. Re:Michigan – I don’t know. It would not be an inexpensive proposition I’m sure. The conservators were great though. They gave us a really nice set of demonstrations. The librarians were very good as well.